As a Nationally Recognized Testing Laboratory (NRTL), TÜV Rheinland can help get your product to market faster, with a cTUVus certification. As a product manufacturer, you already know that North America is one of the largest consumers in the world. This region serves as an enormous purchasing power that offers attractive opportunities to manufacturers worldwide. To ensure product quality, the US and Canadian governments have clearly defined regulations which electronics and other products and equipment must satisfy before they can be approved for sale or for use in the workplace. These products are subject to mandatory testing and certification by an independent third-party testing organization who is accredited in the respective country. TÜV Rheinland offers the services and expertise required to test and certify products and equipment in order to get them to the North American market faster. When you require testing and certification for your product or equipment, choosing an accredited NRTL will give both you and your buyers confidence in your product’s quality. TÜV Rheinland of North America is accredited as a Nationally Recognized Testing Laboratory (NRTL), by OSHA (The Occupational Safety and Health Administration) in the United States, and as a Product Certification Body by SCC (Standards Council of Canada) in Canada. NRTL marks like those issued by TÜV Rheinland tell both consumers and business partners that your products have been thoroughly tested and specifically certified to comply with the electrical and fire safety regulations under the jurisdiction of the accreditation scheme. cTUVus certification can help you gain a significant competitive advantage by reducing time to market and cost for certification and follow-ups. With a single cTUVus mark, customers can demonstrate compliance for both the US and Canadian markets. As a Nationally Recognized Testing Laboratory (NRTL), TÜV Rheinland can test your product for compliance with National Electrical Code (NEC) requirements, OSHA regulations, and with many other state, county, and city requirements for products installed or used in North America. We can also test your electrical equipment and products for compliance with Canadian Electrical Code (CEC) according to national Canadian Standards. Our labs are both accredited by OSHA and SCC, and testing can be handled locally at any of our strategically located US labs. In addition, we can also provide testing and certification for other global marks, such as CB Scheme, GS Mark, and so on, along with your cTUVus Certification. The cTUVus mark is officially recognized as an equivalent and direct replacement of the UL and CSA marks. UL is both a US standards body and a laboratory. National Recognized Testing Laboratories (NRTL) like TÜV Rheinland can test to the same standards and specifications as those defined by UL as US standards. In 1988, OSHA created the NRTL program. Currently, there are 19 registered companies on the OSHA NRTL list. To operate in the US, NRTLs must be accredited by OSHA (Occupational Safety and Health Administration) in an exacting process. This process ensures that the testing laboratory has the necessary equipment, technical skills, physical facilities, and quality management systems to conduct proper testing and certification for each product category in its application. TÜV Rheinland is also officially accepted as a National Certification Bodies (NCB) as part of the IEC System for Conformity Assessment Schemes for Electrotechnical Equipment and Components (IECEE). This international program is based on peer-to-peer review audits and mutual recognition of CB certificates and reports to achieve an equally high technical level. TÜV Rheinland of North America has a certification mark which reflects our evolution as a global product certification leader and the growing importance to thousands of global clients, like you, that benefit from the reputation of our mark. 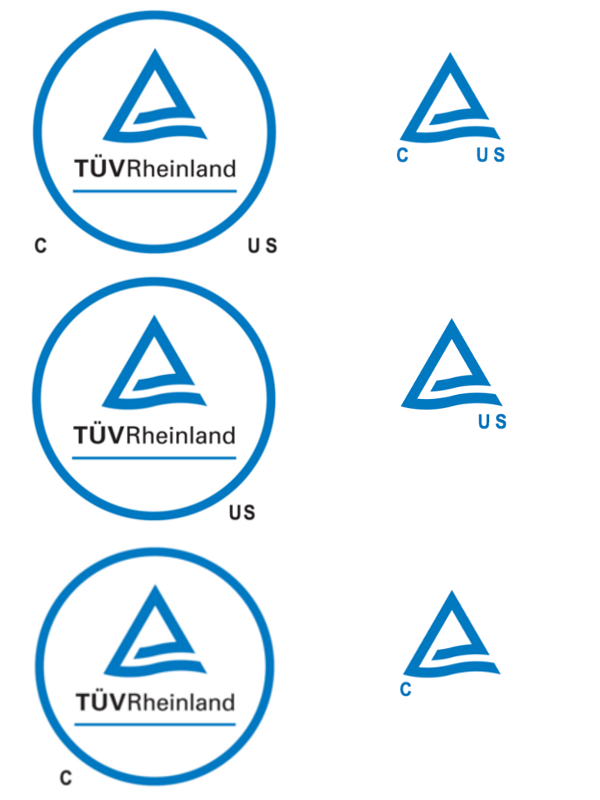 This designed mark reinforces the TÜV Rheinland brand and ensure consistency and ease of recognition among consumers and code officials worldwide, helping your products achieve greater acceptance and faster market entry around the world. Products bearing the cTUV, TUVus or cTUVus Certification Marks reflect supplier commitment and confidence and have been independently confirmed to meet the minimum requirements of US and Canadian electrical safety standards. Please refer to the FAQ tab for more details.